It’s that time of year again where we try to give back to the community and give the Badass Women of Craft our stage to try and raise funds for on organization that’s near and dear to us – Planned Parenthood. That’s right! 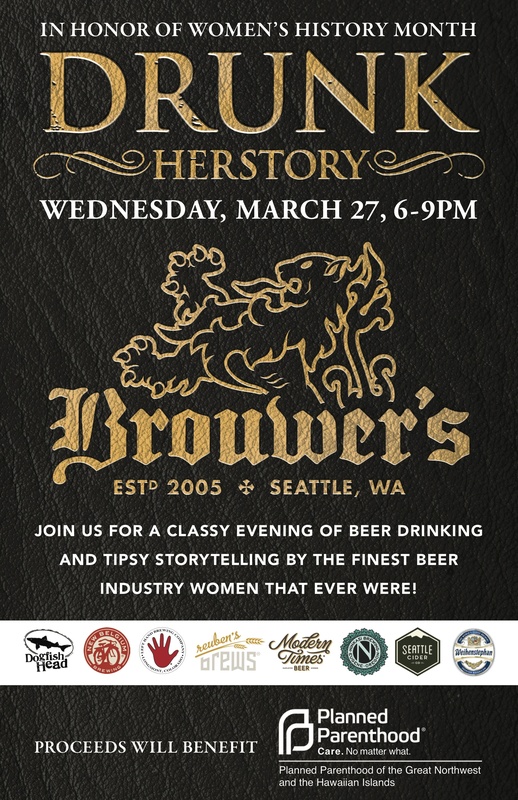 Drunk HERstory, now in its third rad year, will once again be held at Brouwer’s Café on March 27th. After the success of the past two years, we couldn’t keep the train from rolling on. This year, we’ll have 8women representing 8 breweries and they will regale you with tales of awesome women throughout the ages. The night will begin at 6 pm with an introduction by a representative from Planned Parenthood and then move into 4 unique skits to educate and entertain our guests. 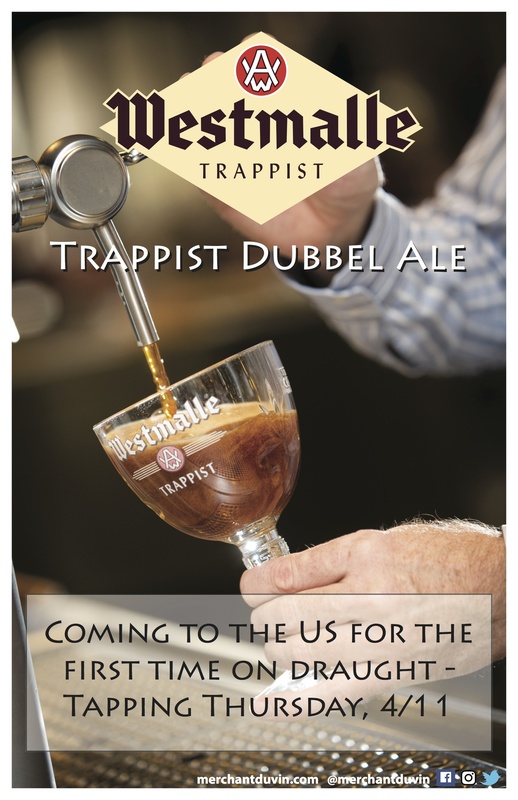 Saturday, March 23rd @ 11am Bottles go on sale at Bottleworks. 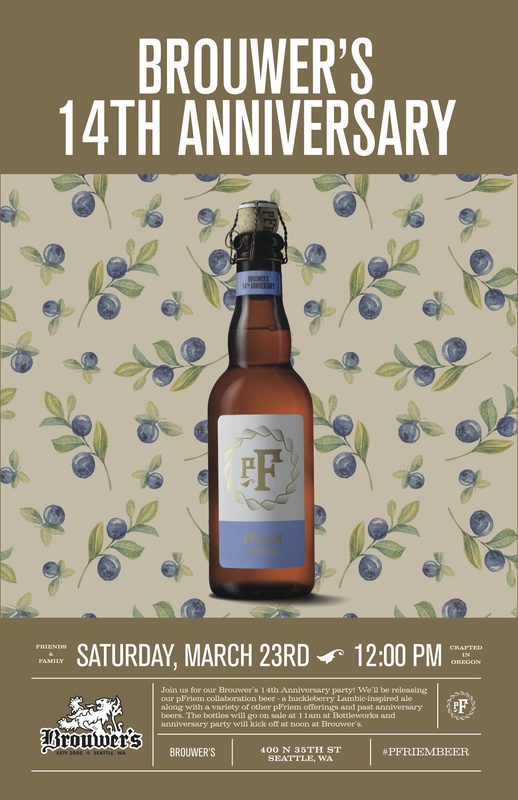 Saturday, March 23rd @12pm The Party starts at Brouwer’s look for past Anniversary beers and Orval to be pouring! The idea of a partnership between Brouwer’s and pFriem has been a topic of conversation since Josh pFriem opened his doors six years ago. While both parties knew it would be awhile before the fledgling brewery would be able to make that a reality, the conversation never ceased. Over the years, on the Washington and Oregon bike trails, Josh and Nat kept the idea alive. When it became time in June of 2017, a small contingency from Brouwer’s made the journey to Hood River to discuss a possible 13th anniversary brew for the restaurant. In sitting down with Josh and Gavin, ideas began to be thrown out in the open. pFriem already had a list of wonderful lambic-inspired selections that would’ve been perfect for a custom blending project. That whole time talking through it, everyone knew there was something out there that begged the question that there was a fruit that needed to be worked with. Nat, from Brouwer’s, was the first to ask what that fruit was. Gavin mentioned that he’d always wanted to work with huckleberries, but that it wouldn’t be an option since there would be no way to source that many foraged berries during the upcoming harvest and having it in time for March. Neither side willing to back down from a new challenge, the decision was quickly made to schedule it for Brouwer’s 14th anniversary and see how many huckleberries we could get our hands on in the meantime. It soon became time to take the hastily scribbled line, “Light sour base w/ huckleberries aged in neutral or white wine bbls,” and turn it into something tangible and delicious. Like many of the fruited pFriem brews, this one starts out as a lambic-inspired base beer that was brewed in January of 2018 and spent 8 months in former white wine barrels to give the beer a nice, soft, lightly tart profile. The barrels were then blended together and racked back into those barrels on top of a ton of huckleberries; there is one pound of huckleberries for every gallon of beer in the barrel. This brew will also serve as a milestone for pFriem, as it is the first time they’ve aged beer on the fruit in the barrels the base beer was aged in, following a long tradition of making fruited sours in the old country. While we eagerly wait for the experiment to bear fruit, the jammy nose of the huckleberries juxtaposed with their sharp tartness has given everyone involved the impression that we are in for something truly special: a uniquely northwest ale made by a wonderful Oregon brewery for a Washington craft beer stalwart using ingredients from both – a true Cascadian partnership. A beautiful hue of reddish violet crowned with slight pink foam; deceiving notes of jammy berry pie and citrus lead into crisp acidity, light funk, a bit of berry, and minor notes of oak. Finishes off-dry, tart, and clean. We are hoping between the two we will be able to raise over $2000. Structures will hosting a similar event in Bellingham the following week. Everyone has something they are passionate about, maybe even worship, and for us that’s Dirt! Those beautiful and challenging ribbons of dirt we call trails, that take us deep into the forest, high up into the mountains, and sometimes to the grandest of vistas. Dirt brings us together and lets us be alone, makes us work hard for even the smallest thrills, brings us joy yet dishes out its certain share of pain! Yet we go back to it over and over again, seeking that connection to the ground, the perfect texture, the fluidity of moving over and through it. The dirt, the trails, they are part of us now! This is how the idea of Dirt Church IPA was born. Most of us can’t be there to build and maintain the amazing network of trails we have here in the Pacific Northwest, but we can certainly help support the awesome and hardworking people who do. The Evergreen Mountain Bike Alliance and Whatcom Mountain Bike Coalition (WMBC) are on the ground (and in the dirt! ), making sure our favorite trail systems stay in great condition. 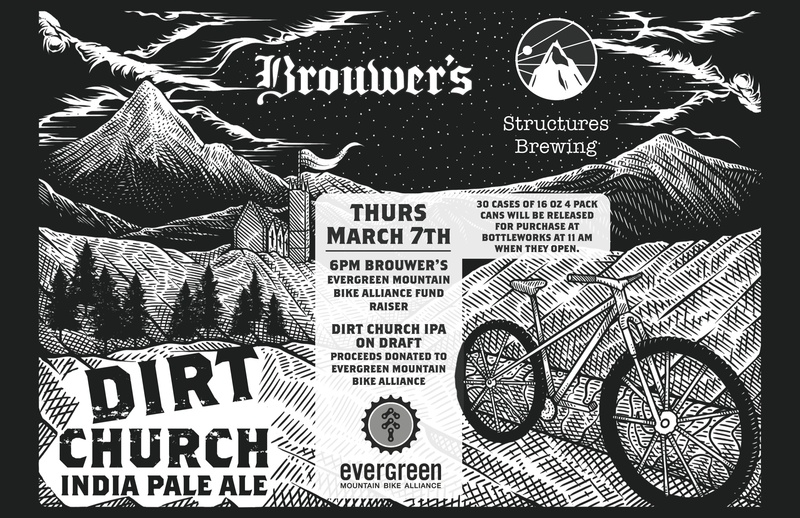 So we are pleased to announce that Brouwers Café and Bottleworks, along with Structures Brewing, will be collaborating on a special Dirt Church fundraising event series. We will host limited beer release parties in Seattle at Brouwer’s for Evergreen, and in Bellingham at Structures for WMBC, with a portion of the proceeds from cans and draft being donated directly to these amazing MTB trail groups. Look for the release to be in March of 2019. Nat Pellman at Brouwer’s Café in Seattle is passionate about Mountain Biking and Beer. He is friends with James and Max at Structures, and quite enjoys collaborating with them on special beer releases, as well as having a cold one (or two!) at their Brewery after a good ride in Bellingham. 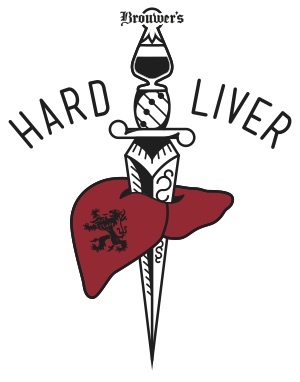 It’s hard to believe that’s it’s been 17 years since Bottleworks decided to host the first HardLiver. So much has changed since then. 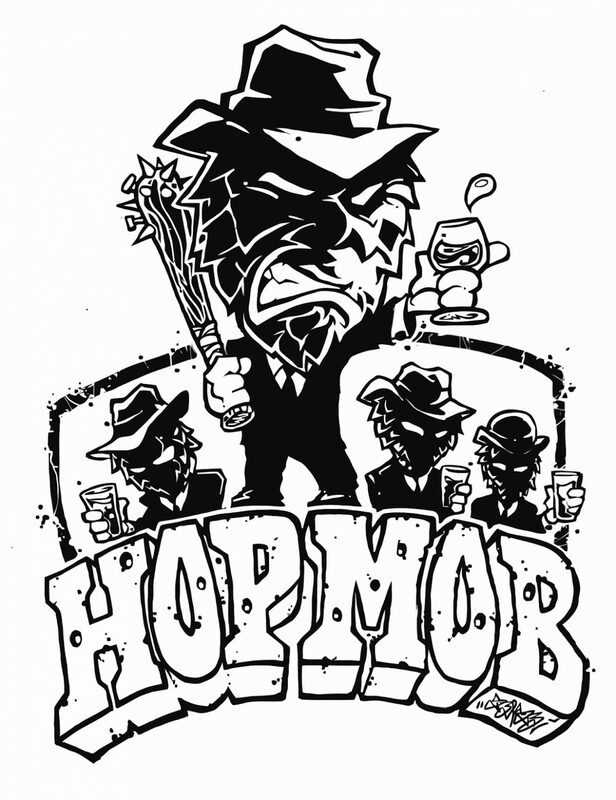 Seattle has been an exponentially growing community bringing with it new ideas, people, breweries, beers, and bars. One thing that hasn’t changed, though, is its taste for pain – both emotionally and physical. As far as emotional pain, get a grow light, we guess; what do we know, we aren’t doctors. The physical, though? Now we might have something for that. Of course, we are taking about Barleywine! That hop and malt treat disguising itself as beer. After sustaining yourself on egg nog, mulled wine, and whiskey through the winter it’s time to come back to barley. As is tradition, we’ll have more barleywines on draft than is doctor recommended. We’ll be hosting this time-honored tradition again the last Saturday and Sunday of February. We’ll have at least 40 beers on draft celebrating the old and welcoming the new. 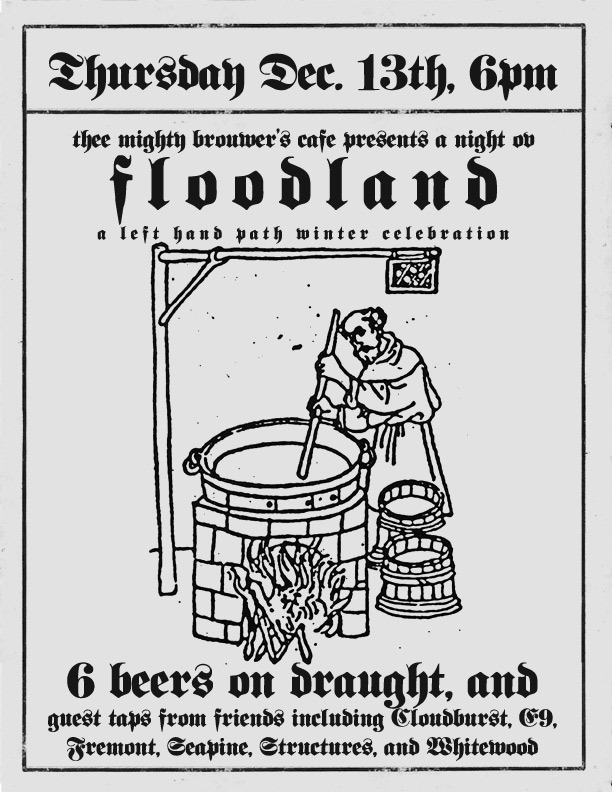 Join us that weekend for some light drinking and friendly fellowship. ! St. Valentine’s Day, a religious and commercial juggernaut brought to you by Geoffrey Chaucer and greeting card companies everywhere. These times, it’s a day to send notes and gifts to those you love and shame those who don’t have anyone. By the way, did you know that total expenditures for V-day in the US totaled $18.2 billion in 2017? Ah money love, isn’t it romantic? Nothing says it quite like being expected to buy something nice/make a grand romantic gesture/ tell the person or people (hey it’s 2019, right) how much you love and care about them. I mean, it’s not like you can do that just any ol’ time; what are we, horny teenagers? Urban Family, we love your beers. They lift our hearts high and make our stomachs sing. From the dankest haze bombs to the tartest sours, we are in amour with your electric elixirs. Won’t you spend the Loveliest Day of the Year™ with us, wondering us with your wares? What we really admire though? 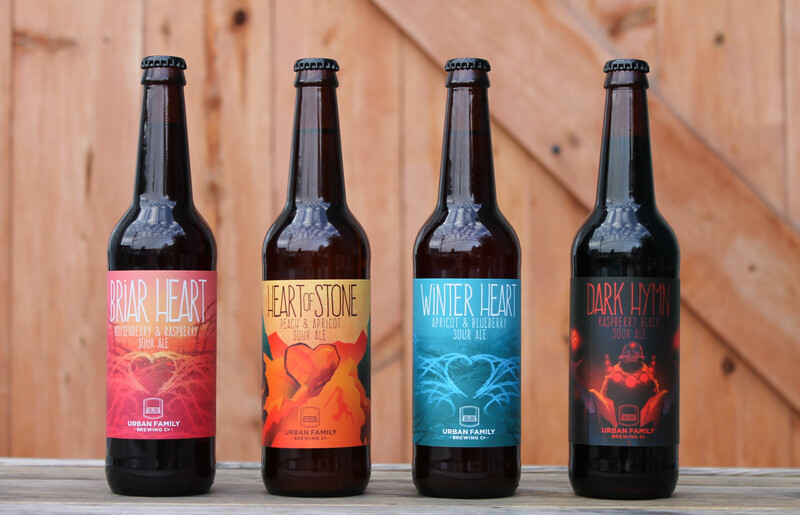 Well, it would be your Sour Heart… series of beers, those tangy tongue tantalizers that drive us wild. Since it is Seattle, a major progressive town, do you mind if we invite some friends? No? Perfect! Join us on February 14th for our Valentine’s Evening with Urban Family Brewing. 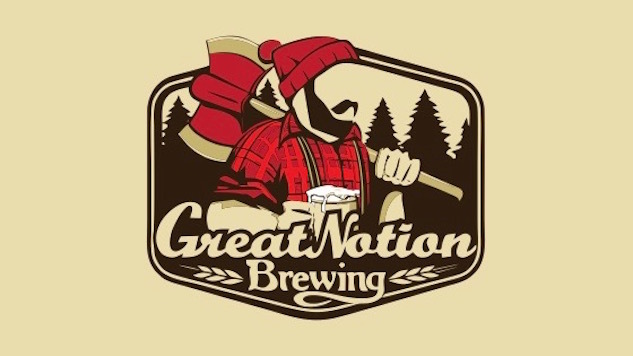 We’ll have Briar Heart, Tropic Heart, and Winter Heart all available on draft. We might even have an IPA or two on just to round things out. The love-in will begin at 6 pm. 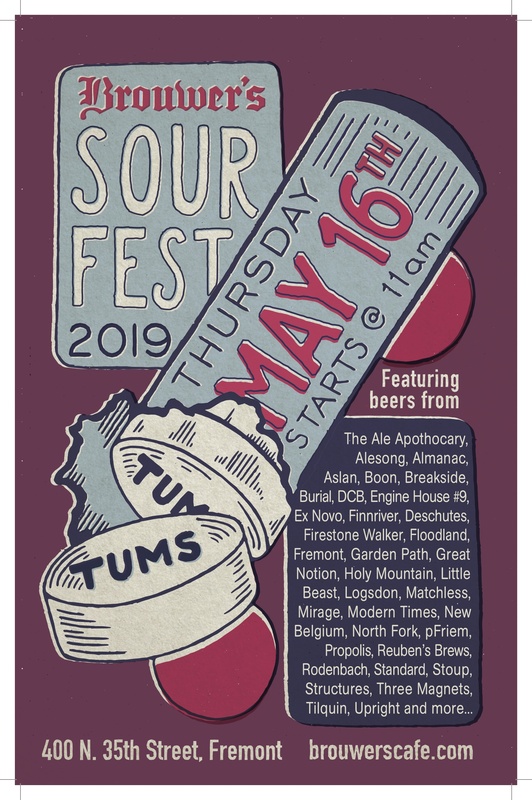 Here at Brouwer’s we are into training; training our staffon beer, training ourselves to handle the rigorous festival schedule we setforth, and training our palates to be the most knowledgeable we can be. But what about our dear guests who find themselves needing to gear up for the events of February through May?! We haven’t left you out. You may ask, “Gee, how are you going to help us get ready for Hard Liver, your anniversary, and Seattle Beer Week?” Great question! 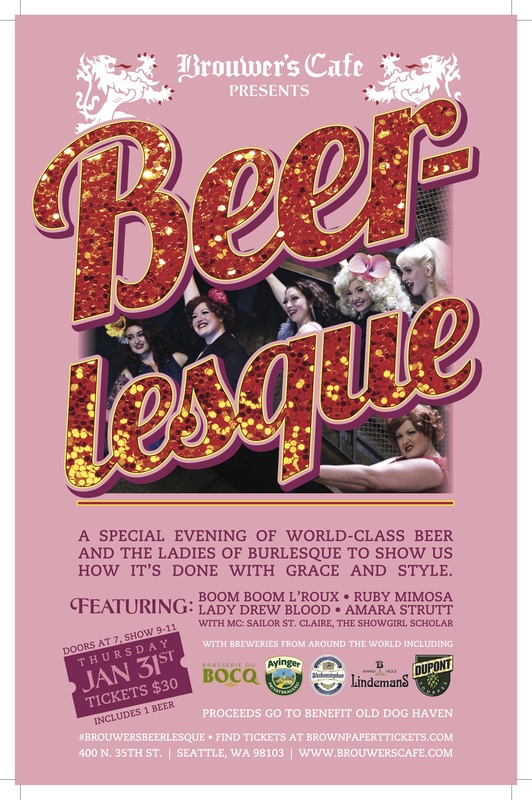 BEERlesque – A special evening of world-class beer and the ladies of burlesque to show us how it’s done withn grace and style. After the rousing success of last year, it was inevitable that we’d give it another go at hosting one of our favorite events of 2018. This year’s performers will be Boom Boom L’Roux, Ruby Mimosa, Lady Drew Blood, and Amara Strutt. Joining us once again to MC will be none other than Sailor St. Claire. 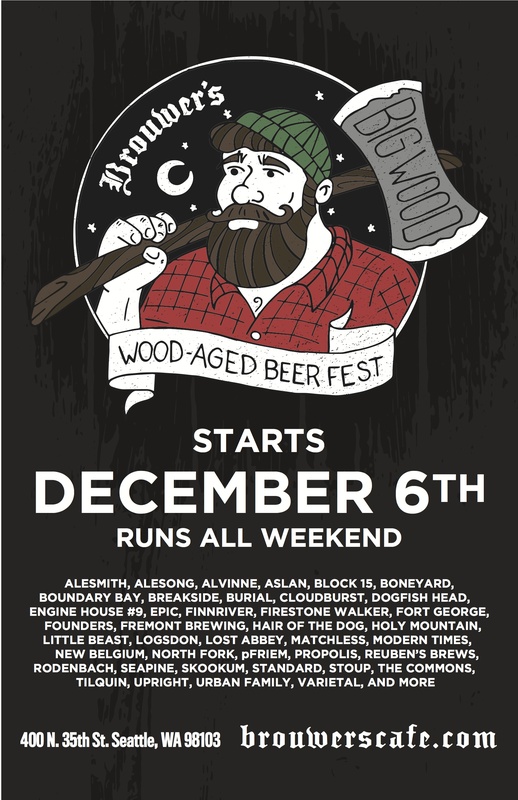 Like last year, this will be a ticketed event and proceeds will go to charity. The charity this year will be the Old Dog Haven, a wonderful organization dedicated to taking care and finding forever homes for older pups. 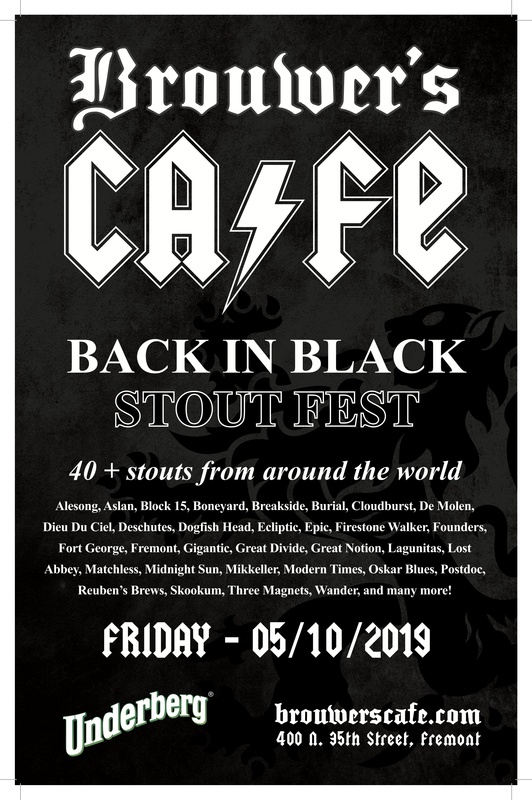 Tickets are $30 and include a beer from one of the partner breweries – Ayinger, Brasserie du Bocq,Dupont, Lindeman’s, and Weihenstephan. There will be a change in protocol this year, however. Doors will open at 7 and the show will begin at 9. This will allow attendees to order and enjoy dinner beforehand. Dinner service will end when the show begins to limit interruptions. Please go to www.brownpapertickets.com to secure your ticket to what we’re sure will be a sold out show. We will be closed December 24th-25th and January 1st. Be there, or we’ll call Abigail. It’s that time of the year, the time when the days get short and the sun becomes a hot commodity. It is time for the wearyites of Seattle to take to the insides of bars and coffeehouses in search of warmth and polite human interaction. Heat, beer, coffee, commiserating… there seems to be one thing missing, though – chocolate. Chocolate, you say? We do say. New Belgium Brewing has paired with our neighbors over at Theo’s to bring you four beer and chocolate pairings that are guaranteed to bring a smile to your face and help you forget about the drab days ahead.